From an invigorating winter beach walk to indulging in some old-fashioned holiday glitz, give yourself the best of the season with these unique local adventures. You may think the season’s most appealing option is to cocoon indoors until drier and warmer weather returns, but the best way to fight those winter blahs is just the opposite: numerous studies tout the perks of outdoor activity, including reducing stress and boosting your energy levels. Round up a group of friends and head out to Witty’s Lagoon, where you’ll find an easy network of trails. The Beach Trail passes the scenic Sitting Lady Falls before meandering through the trees to the shore. At the beach, low tide creates visible sand dunes, and the area is prime for birdwatching, year-round. Glenrosa Farm Restaurant. PHOTO: DEAN AZIM. Afterwards, nearby Glenrosa Farm Restaurant makes the perfect place for a mug up. 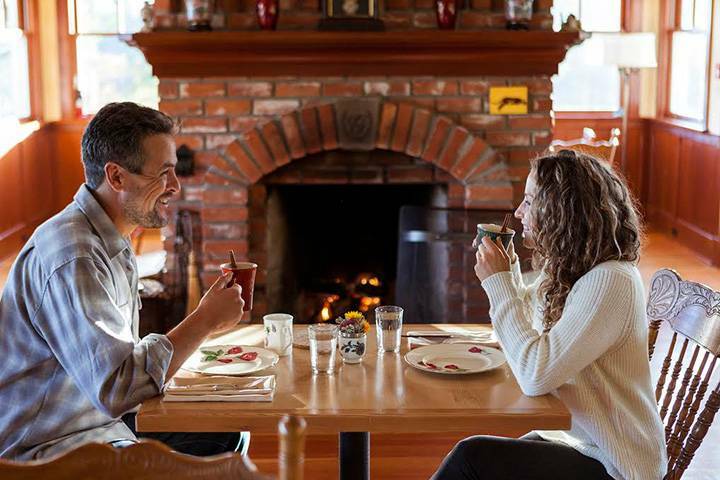 The historic farm invites lingering, with its cozy fire, art and tea room. Look for special seasonal beverages on its happy-hour menu. At Mary’s Farm & Sanctuary near Goldstream Park, you’ll find time and space to slow down and “just be” in the peaceful presence of the horses. Rostad has over 25 years of insight and wisdom as a horsewoman, an educator and a mindfulness teacher. During your one-hour equine guided learning session, staff will facilitate your personal interactive experience with the horses — sessions are one hour and are unique to each person and also unique to any given day. 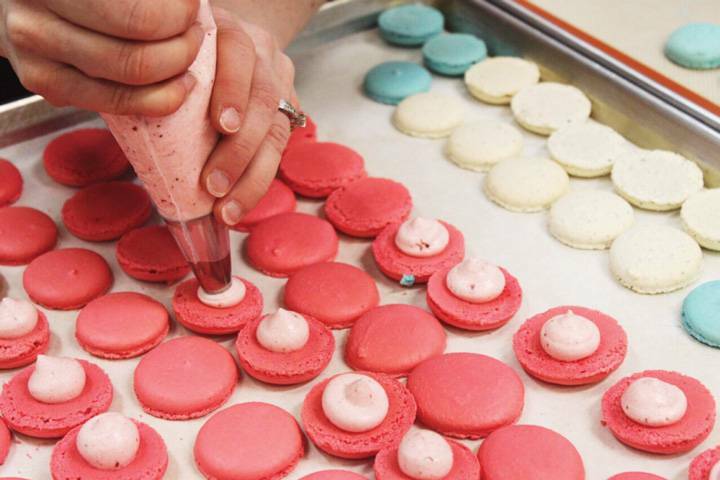 Did you know that Bon Macaron Patisserie hosts hands-on macaron classes? Owners Yann Fougere and David Boetti — both native Frenchmen — show you everything from how to make the shells and fillings to different decorating techniques. The three-hour classes are held approximately twice a month, but private group classes can also be arranged. Bon Macaron offers 50 sweet flavours and along with standby favourites, such as Triple Chocolate and Crème Brûlée, seasonal flavours are available in December. Think Candy Cane, Gingerbread and Mulled Wine. Everyone leaves with 30 to 40 macarons in several different flavours — whether to eat or to gift is up to you. Owls, such as Arktos the Great Horned Owl, are in the spotlight this fall and winter at The Raptors. 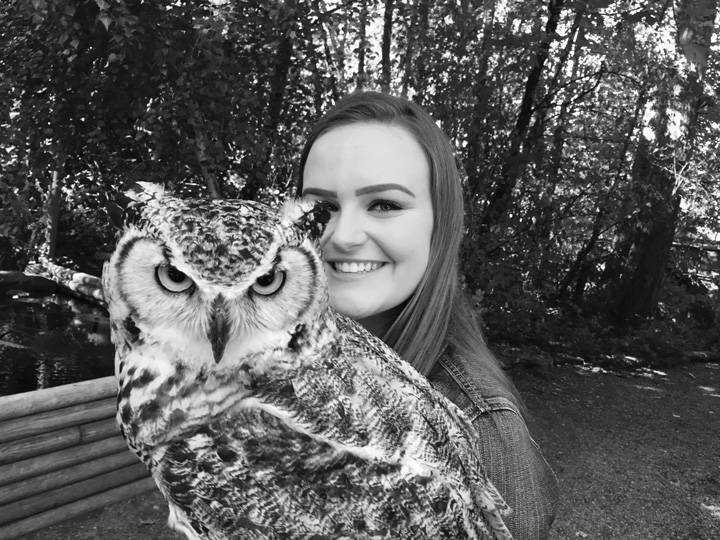 Forget partridges and turtle doves — get yourself to The Raptors in Duncan for an interactive experience with a variety of birds of prey. You will get closer than you ever imagined to eagles, hawks, owls and falcons. Time your visit around the daily flying demonstrations, held at 1:30 p.m., Thursday thru Sunday, during November and December. The centre will also be running its popular Close Encounter experience, where you’ll get to hang out with several species of raptors on your glove. “It’s a great time of year to do it because the sessions aren’t as busy,” says operations manager Robyn Radcliffe. Plan for a late lunch at the Crow & Gate English Pub. This hidden gem — complete with pegged beam and plaster, and open stonework fireplaces — offers traditional nosh and pints. Do save room for the Christmas pudding with rum sauce. Time the trip back to see the Festival of Lights in Ladysmith. The six-week affair is in its 30th year and sees Ladysmith’s downtown sparkling with over 200,000 twinkling holiday lights. The Festival of Lights runs from November 30 until the first Sunday in January and its kick-off festivities, complete with a craft fair, spaghetti dinner, parade, fireworks and the official Light Up, is considered a destination event, drawing thousands from around the province. Do your holiday traditions include family downtime over a massive jigsaw puzzle? Consider upping the ante with an escape-room experience, a live game that utilizes puzzles, riddles and codes hidden throughout a locked room. You and your companions will be required to think creatively and cooperatively to solve the game, find the key and escape the room. Don’t worry about the scare factor: Epic Escape’s two puzzling scenarios (a small NY apartment or a Mississippi State Prison cell) are terror free and don’t use startle tactics. If board games are more your speed, do check out the Interactivity Board Game Cafe. With over 500 games, it’s a great spot to try a new one. 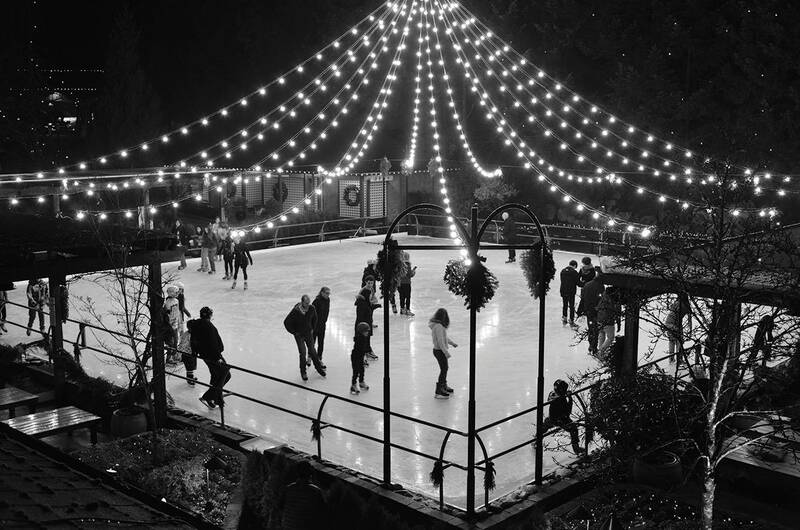 The Butchart Garden skating rink, pictured here, with its twinkling lights, is open from December 1 to January 6. Bear Mountain also features a skating rink from November 25 to January 8. Have you ever found yourself watching Olympic curling and thinking, “That looks easy!”? Well, here’s your chance to see how you’d actually fare. The Victoria Curling Club (VCC) will be hosting monthly drop-in Blender Nights, perfect for beginners or those who want to check the sport out. “It’s four ends of fun, beer and a live band playing upstairs,” says Paul Dixon, the club’s general manager. The VCC is also home to the BC Scotties this January, when the best women curlers in the province come to Victoria to compete for the right to represent B.C. at the Canadian Championships. The event is expected to inspire more locals to take up the sport, and Dixon says the rink will start a mini “Learn To Curl” program in mid-January. If you’re looking to warm up those bones, get yourself to Red Hot Swing’s weekly Saturday-night social and strut your stuff on the dance floor in the Bert Richman Building at the Gordon Head Rec Centre. Each social includes a drop-in beginner lesson that will have you dancing in no time — no partner or experience required. (Organizers do recommend bringing your sense of humour.) Following the lesson, there’s jazz music for dancing the night away. A live band makes an appearance on the last Saturday of every month, and other weeks feature a DJ spinning toe-tapping tunes, perfect to show off your newfound skills in the Lindy hop, Charleston, Balboa and Collegiate Shag. The Christmas Craft Beer Show (held at Save-On-Foods Memorial Centre on December 1 and 2) was established with the belief that beer should be enjoyed any time of the year — it’s not just about a cold glass of suds on a hot day. This hoppy celebration brings together all the fantastic local microbreweries to share their seasonal offerings, such as Hoyne’s Gratitude Winter Warmer and Vancouver Island Brewery’s Hermannator Ice Bock. Your admission ticket gets you a souvenir sample cup and lanyard, a program and a couple of beer tokens to get you started. There is much to celebrate about Victoria’s new rep as a capital of cool (Vogue said so!) and a big part of that is its rich cocktail culture. Experience downtown’s holiday splendour by assembling your crew for a self-guided cocktail tour — to be undertaken in one night or over several; choose your speed. Start at the new kid on the block, Foxtrot Tango Whisky Bar, and soak up its speakeasy vibe as you imbibe an After School Snack, an Averna and rootbeer cocktail served in a vintage milk jug, with chocolate chip cookies and a comic in a vintage lunch box. Next up is the familiar comfort and elegance of Clive’s Classic Lounge. 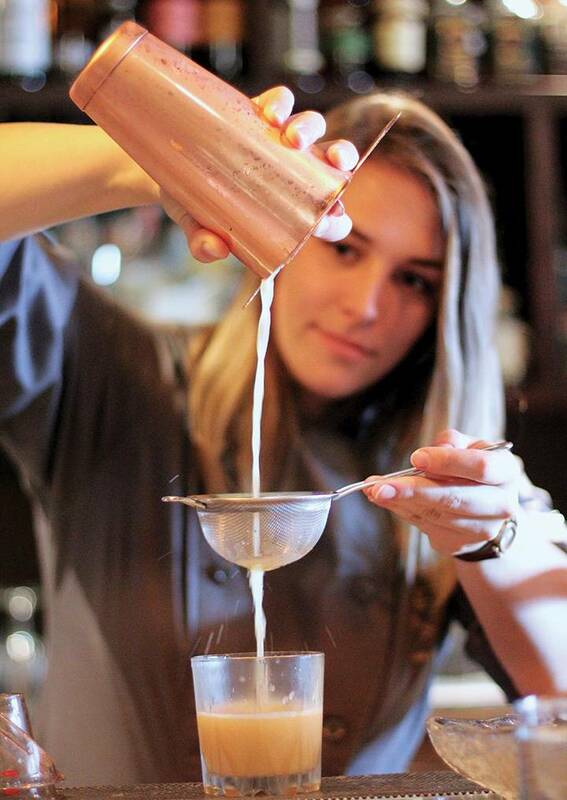 Warm up over a Zhivago’s Toddy, a hot concoction of brandy and Silk Road’s Jewel of India Black Tea. At Little Jumbo, cozy up and stay on season with a blended Scotch Corduroy and Cable Knit cocktail. Finish up with the impressive harbour views from the Q Bar, where the purple-hued Empress Gin 1908 gives their 1908 cocktail a colourful makeover. The camaraderie and tranquility of a beach bonfire can be savoured year-round and is made even better in the winter by the lack of crowds. Pack a bag of marshmallows and a thermos of hot cider, put on your hiking shoes and head to Mystic Beach. This is considered one of the area’s most scenic beaches and even features a small waterfall that cascades from the sheer cliff above. To make your firepit, set a circle of stones around a small, shallow pit in the sand and create a teepee of driftwood and logs around a centre of smaller twigs (and any starter material you may have, such as paper). When the party is over, be sure to douse the fire with water and cover all the ashes with sand. 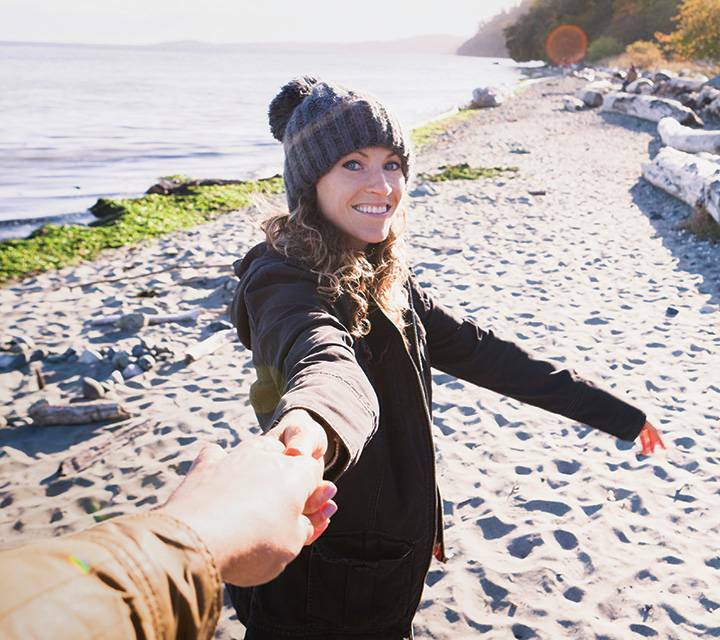 Whether it’s with your true love, your entire family, a group of local friends or visitors from out of town, pick your adventure and get out of the house this holiday season. Hey, it’s a long winter; why not try all 12?